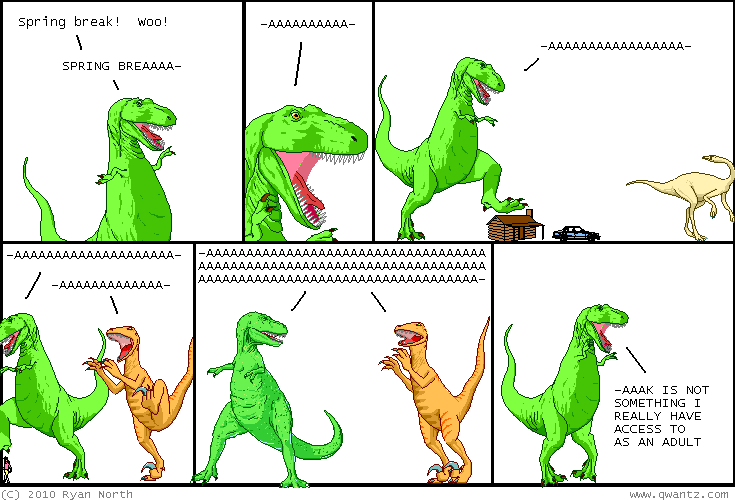 Dinosaur Comics - June 28th, 2010 - awesome fun times! –The answer is "Definitely yes!" June 28th, 2010: I didn't get any emails from people who found love on Friday during Feel Free To Say Hi If I'm Wearing A Dinosaur Comics Shirt Day; maybe they are still busy smooching? I did receive a few emails from people who wore their Dinosaur Comics shirts and nobody unexpected talked to them, which suggests either two things: either the next event should be "Sheesh, Folks Need To Be Less Shy Day", or it should be "Tell Everyone To Read Dinosaur Comics so that A Full One Third of the World's Population Reads It and then The Whims Of One Cartoonist Can Carry More Weight Than The Full Might of Many Nations Day". But then I thought, hey, there's no reason it can't be both! So consider that day today, and consider that decade this decade!